We studied a number of magmatic Ni–Cu–(PGE) sulfide deposits in two distinct belts in eastern Botswana. The Tati belt contains several relatively small deposits (up to 4.5 Mt of ore at 2.05% Ni and 0.85% Cu) at Phoenix, Selkirk and Tekwane. 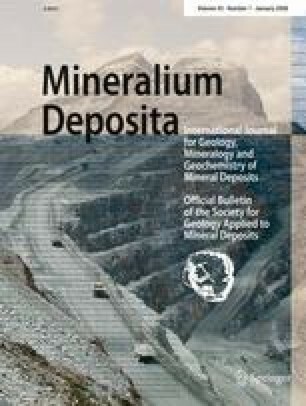 The deposits are hosted by ca 2.7 Ga, low- to medium-grade metamorphosed gabbroic–troctolitic intrusions situated within or at the periphery of a greenstone belt. The deposits of the Selebi-Phikwe belt are larger in size (up to 31 Mt of ore grade). They are hosted by high-grade metamorphosed gabbronorites, pyroxenites and peridotites believed to be older than ca 2.0 Ga that intruded gneisses of the Central Zone of the Limpopo metamorphic belt. The composition of the sulfide mineralisation in the two belts shows systematic variation. Most of the mineralisation in the Tati belt contains 2–9% Ni and 0.05–4% Cu (Cu/Cu + Ni = 0.4–0.7), whereas most of the mineralisation in the Selebi-Phikwe belt contains 1–3% Ni and 0.1–4% Cu (Cu/Cu + Ni = 0.4–0.9). The Cu–Ni tenors of the ores in both belts are consistent with crystallization from a basaltic magma. The Tati ores contain mostly >3 ppm Pt + Pd (Pt/Pd 0.1–1), with Pd/Ir = 100–1,000, indicative of a differentiated basaltic magma that remained S-undersaturated before emplacement. Most of the Selebi-Phikwe ores have <0.5 ppm Pt + Pd (Pt/Pd < 0.1–1), with Pd/Ir = 10–500. This suggests a relatively less differentiated magma that reached S saturation before emplacement. The Tati rocks show flat mantle-normalised incompatible trace element patterns (average Th/YbN = 1.57), except for strong enrichments in large ion lithophile elements (Cs, Rb, Ba, U, K). Such patterns are characteristic of relatively uncontaminated oceanic arc magmas and suggest that the Tati intrusions were emplaced in a destructive plate margin setting. Most of the Selebi-Phikwe rocks (notably Dikoloti) have more fractionated trace element signatures (average Th/YbN = 4.22), possibly indicating digestion of upper crustal material during magma emplacement. However, as there are also samples that have oceanic arc-like signatures, an alternative possibility is that the composition of most Selebi-Phikwe rocks reflects tectonic mingling of the intrusive rocks with the country rocks. The implication is that orogenic belts may have a higher prospectivity for magmatic Ni–Cu ores than presently recognised. The trigger mechanism for sulfide saturation and segregation in all intrusions remains unclear. Whereas the host rocks to the intrusions appear to be relatively sulfur poor, addition of crustal S to the magmas is suggested by low Se/S ratios in some of the ores (notably at Selebi-Phikwe). External S sources may thus remain unidentified due to poor exposure and/or S mobility in response to metamorphism. An erratum to this article is available at http://dx.doi.org/10.1007/s00126-007-0169-8. We thank Tati Nickel for facilitating sampling of the Phoenix and Selkirk deposits and for allowing publication of the data. Richard Lewis, Admore Botepe and Kebalemogile Tau assisted WM and GC during the fieldwork. Falconbridge Ventures of Africa allowed sampling at Tekwane. The analytical work was partly funded by the Centre for Research on Magmatic Ore Deposits at the University of Pretoria (to WDM) and NSERC (to SJB). Peter Lightfoot and an anonymous reviewer provided detailed reviews that greatly improved earlier versions of this paper. Additional suggestions for improvement were made by Larry Meinert.